Today, just months after the Rubrik Alta 4.1 release, we’re excited to announce that Rubrik has been designated an ISV co-seller through the Microsoft Partner Network to offer our hybrid cloud management solution on Microsoft Azure. Expanding our partnership with Microsoft enables enterprise, government, and nonprofit customers to transform their organizations and fully leverage a hybrid cloud model. To me, our extended partnership with Microsoft is Rubrik’s Plaid Mode. In a mere few months, Rubrik has gone from being a small partner to being a top MS ISV. We began our Azure journey earlier this year. The initial step was to target new features for Azure to bring us into a leadership position among cloud providers. Our engineers delivered at lightspeed with the release of Rubrik Alta 4.1. The release expanded our CloudOn services to Microsoft Azure, pioneering server-less conversion of VMs to cloud instances. This lowers the costs of disaster recovery and test/development in Azure by utilizing cloud services only when needed. With Alta 4.1, Rubrik also became one of the first data management vendors to support Microsoft’s new private cloud offering, Azure Stack. 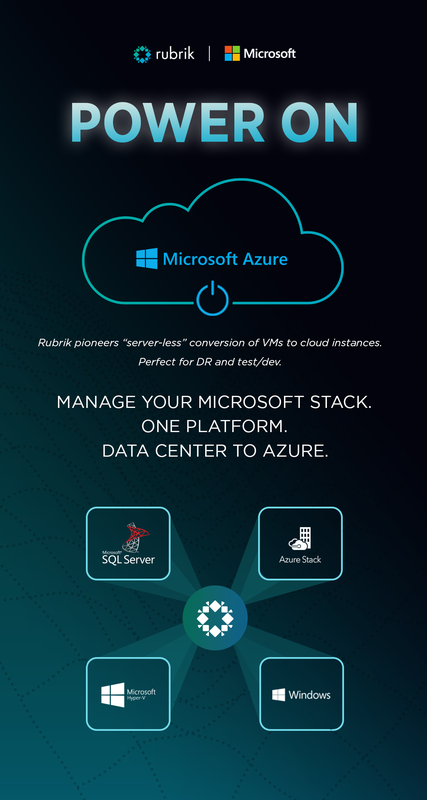 With Rubrik and Azure Stack customers can now develop applications and easily migrate from on-prem to cloud for test/development, cloud bursting, or disaster recovery. These new capabilities allow users to manage their entire Microsoft stack on a single software-defined platform. At Rubrik, every action we take is a thought-out strategy to benefit our customers. By deploying Rubrik alongside Azure cloud and Azure Stack, companies can protect, recover, manage and secure critical workloads regardless of where their data resides. In addition, customers can leverage Rubrik to seamlessly protect data and accelerate app delivery across Azure and Azure Stack. We are honored and humbled to become a Microsoft ISV Co-Sell Ready Managed Partner and help Microsoft customers across industries mobilize their application data. Through our collaboration, Rubrik can better deliver a scalable, efficient, and cost-effective data management solution in the cloud. Thank you to the Microsoft Partner Network team for enabling this partnership. We look forward to furthering Rubrik’s mission of creating a cloud-first solution for the modern enterprise. Ranajit Nevatia is VP of Business Development and Alliances at Rubrik. He has a 20-year track record of scaling start-ups in early stage to building products within large companies in the field of enterprise storage software and cloud technology. Previously, he served as CEO and President of Datagres.